College of Health Technology Calabar, CHT, Calabar National Diploma [ND] and Higher National Diploma [HND] Admission Form, Admission Requirements, Application Guidelines and Deadline for 2019/2020 Academic Session. Applications are invited from suitably qualified candidates for admission into the College of Health Technology Calabar, for the 2019/2020 academic session. Admission into the College of Health Technology, Calabar commences in March, 2019 of each year. Interested candidates submit their applications using an electronic platform (e-Application). Community Health, Medical Laboratory and Pharmacy are among the most sought after departments in the college. The application process will run for about three months after which an entrance aptitude test is written sometime in June, 2019. Candidates applying for admission into NBTE courses are exempted from writing the entrance exam. Successful candidates at the entrance exam then proceed to the next stage which is a written interview and inspection of credentials. Candidates who pass the interview are then offered admission into the college. Also, candidates applying for admission into NBTE courses who meet the JAMB cut off mark are also offered admission. It is important to note that candidates coming into the college through JAMB can apply for admission up till September. Candidates who are unsuccessful at the interview stage but who passed the entrance exam, can apply for supplementary admission into other programmes provided there is vacancy in that department. 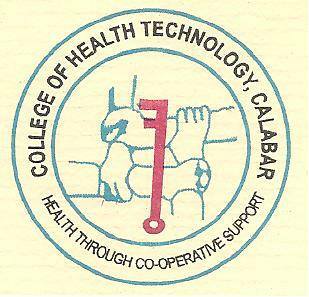 Admission into College of Health Technology, Calabar is a very competitive and transparent process. Prospective students must study hard in order to gain admission into the college. The college also adheres strictly to its admission quota as provided by the respective regulatory boards and NBTE. 1. PUBLIC HEALTH NURSING TWO YEARS a. Nigerian Registered Nurse (NRN). 3a. COMMUNITY HEALTH EXTENSION WORKER (CHEW) THREE (3) YEARS Five (5) Credit level passes at WASSC/SSCE/GCE/NECO O'level not more than two (2) sittings. English Language, Mathematics, Physics, Chemistry and Biology. PHARMACY TECHNICIAN CERTIFICATE. 8. COMPUTER SCIENCE TWO (2) YEARS Four credit level passes in WASSC/SSCE/GCE/NECO at not more than two sittings. The four subjects must include Mathematics, Physics, English Language and any other subject. JAMB score of 150 and above (JAMB subjects are English Language, Mathematics, Physics and Chemistry). 1. Walk into any branch of First Bank Nigeria and pay the sum of Eight Thousand Naira only (N8,000.00) for the application form through the PayDirect platform. Use the code CRSH for institution's code. Candidates are strongly advice to read the Entry Requirements above before proceeding to submit an application. The College of Health Technology Calabar entrance examination for 2018/2019 academic session holds on the 9th of June 2019. The closing date for sales of form is 1st of June 2019.